Is it time for the Philippines to invest in a national space agency? Scientists say that we should, and soon. Reaching for the stars might just be the solution to many of the country's national problems such as weather prediction, disaster management, telecommunications, and national security. "When you ask an ordinary Filipino, the common impression is that we don't need something that's so far out. But one thing that most Filipinos don't realize is that space science has a huge impact in our daily lives," said Dr. Rogel Mari Sese, assistant professor in physics and head of the Astrophysics Laboratory in the University of the Philippines-Los Baños. Space sciences brought us the GPS, allowed us to make transnational calls through satellite-based communication, and began the foundations of the technology responsible for developing our laptop computers and digital cameras. Before sending astronauts to space, launching the satellites will be the first priority should a space program be established in the Philippines. We could launch bigger satellites meant to provide faster Wi-Fi connections and more reliable telecommunications signals across the entire country. That way, the technology would be truly ours and not "borrowed" from other countries. even far-flung areas of our country will receive reliable communication platforms. Science advocacy partylist group Agham's spokesperson, Angelo Palmones, believes that this would open doors to several possibilities, including telemedicine, where telecommunication devices are used to help in providing health care to people far away. Bigger satellites would take millions of dollars and decades to complete. But more recent technologies allow scientists and engineers to build smaller, more robust satellites. The picosatellite, also called the "cansat" since it's the size of a soda can, can be used for disaster management. "We can launch small instruments that can take an aerial survey of a particular area to determine which areas are affected by, say, flooding. And it's much low cost much easier than getting a helicopter, driving there and taking a picture because everything is automated," said Sese. Since it is a very robust technology, it can be adapted to different purposes, like aerial surveys, environmental monitoring and scanning, and defense. "It's technically not the satellite that we are thinking now na nag-o-orbit, but the technology is similar to what is actually orbiting. The development process of that cansat and an actual satellite are the same." Another small satellite called the cube sat measuring 10cm by 10 cm by 10 cm takes two years to develop. The technology is also so robust that the developer can alter its functions to meet a specific need. "That's one technology that we should consider going into. Kasi it's easily attainable, it doesn't need much resources," Sese said. "Fifty million is way more than enough for that." Sese said that the Philippines has enough professionals capable of developing this kind of technology. Experts in the fields of physics, computer science, mechanical engineering, aerospace engineering, and electronics and communications engineering can build a satellite like such if they work together. "Yung nga lang hindi sila nagcocollaborate. But if we can get these people to work together, then in two years, we can have our own satelllite." Absence in space, a threat to national security? The Philippines does not have its own satellite, which means that we don't have direct access to space. This is an issue of national security and is of vital importance to the Philippines. "The moment that the other countries cut off our access to space, paano na tayo?" Space is the "next frontier" and losing access to it will leave the Philippines lagging behind. He also said that it is a huge security for us not to have access to space. "Our election (results) actually passed through Singapore through Singtel. So imagine the security risk of allowing a foreign country to have access to the potential results of the political landscape in the Philippines. Pag minodify naman nila yun sa satellite, wala naman makakaalam. It's very easy to do that," he said. "Our coastguard is not capable of protecting the whole territorial waters of the country diba? But through satellite data, you can actually see if certain ships are actually trespassing through the waters of the Philippines." Hence, the importance of having an agency that will centralize all these functions. Agham's Angelo Palmones is lobbying for the second time, a bill called the Philippine Space Act of 2012. 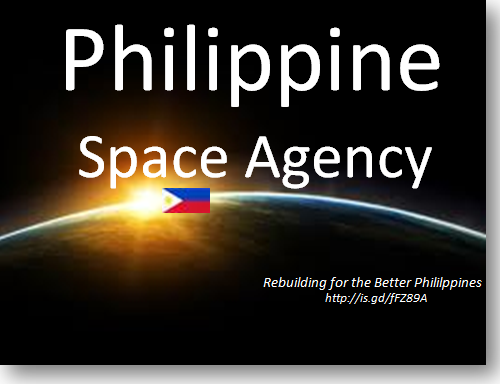 It attempts to create the Philippine Space Agency – a body in charge of all space programs and efforts in the country. It will also be mandated to develop a road map for space science in the Philippines. 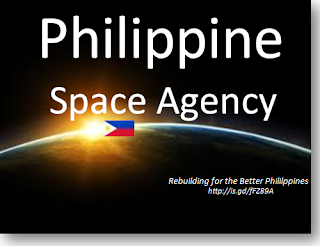 Among the agency's objectives are: to promote the peaceful use and exploitation of space and advance the knowledge of space through research; to help promote national security; to ensure that space S&T shall provide economic benefits for the nation and help raise the standard of living of Filipinos; to cooperate with other institutions in the country, or in other nations or groups of nations for work to be done in pursuant to this Act; to expand and utilize scientific and engineering resources in close cooperation with and among different institutions in the Philippines in order to avoid duplication of effort, facilities, and equipment. Today, the space program of the country is disorganized, given that it is scattered in different agencies such as the Philippine Atmospheric, Geophisical and Astronomical Services Administration (PAGASA), the National Mapping and Resource Information Authority (NAMRIA), and the National Disaster Risk Reduction and Management Council (NDRRMC). "Walang iisang direksyon on how we can harness information from the space to address disaster mitigation, telecommunication, and planning in general," Palmones said. This set up, he said, causes misunderstanding and duplication, when together, they can use each others' resources to help one another. The establishment of the Philippine Space Agency aims to consolidate and centralize all of the country's space efforts, and work towards launching our own satellites. It will take about 500,000 million pesos to establish this agency, Palmones said. "Meron na tayong existing agencies e. So may mga funding na ito." Sese's estimate is at one to two billion pesos (₱ 2 Billion Pesos). Pushing for the bill is only half the battle. Sese said that we also have to take care of the education aspect and train people who would be experts in the space sciences. Otherwise, we'd have an agency without the qualified personel. "We want to have a sustainable space program. It's easy to have a space program. But to have a sustainable space program is much more difficult. We need people who are trained, we need people who are educated in this field." Sese said that we have to start training people now if we want a space agency established three or five years down the line. "Somewhere, we have to find the balance between the two. Number of people being trained and yung facility, medyo sabay sila (dapat mag-grow)," he said. Compared to Japan and the United States, we are way behind when it comes to space sciences. But within the neighboring countries of Southeast Asia, we're somewhat in the middle. Sese said that we're fifth out of the ten Southeast Asian nations, behind Thailand, Indonesia, Malaysia, and Vietnam. Thailand has a good astronomy program, while Vietnam continues to improve with telecommunications. Indonesia has the longest tradition of space education spanning over 90 years. "In a way, there's still time for us to catch up," Sese said. "We always succumb to the belief that we don't have money. And I disagree," Palmones said. "If funds are properly used and channeled to more laudible programs, matagal na dapat naumpisahan. But simply because we believe that it's not necessary and we don't have so much money." Vietnam—which started its space research much later, in 2006—was able to launch its first satellite VINASAT-1 in 2008.